In the Café de Chinitas / said Paquiro to his brother: / ‘I am braver than you / a better bullfighter and a better gypsy’. These are verses that Federico García Lorca wrote as a tribute to the oldest Café Chantant in Spain and direct ancestor of today’s flamenco venues known in Spain as tablaos: Café de Chinitas in Málaga, which, from 1857 to 1937, opened its doors to the general public and indeed to ruffians, offering them the purest and most genuine flamenco anywhere to be found. Moving quickly ahead to 1969, members of the Verdasco and Heras families, the owners of the traditional restaurant La Bola, decided to open a new business that would pay homage to the legendary café that inspired Federico’s verses. The premises they chose could not have been more appropriate: a venerable and indeed stately 18th century mansion on Calle Torija No. 7, just behind the Senate and very close to where Plaza de la Ópera, Plaza de Oriente and Plaza de España intersect. In the 1970s, flamenco tablaos were all the rage in Madrid and they attracted emerging figures from all corners of Spain, all driven by a desire to triumph in the capital, while those stars who were already firmly established in the flamenco firmament filled the wee small hours with their art under the watchful gaze of a distinguished public and foreigners of renown. Mara Verdasco, the family member who founded and continues to run Café de Chinitas today, recalls how “the late 60s and early 70s were the golden age of the tablaos. In those days they were five-star restaurants where everyone was dressed up to the nines and dinner would cost you 2,500 pesetas, a lot of money back then. Those nights that have gone down in history started at ten or half past ten and the regulars would be there until four or five in the morning. 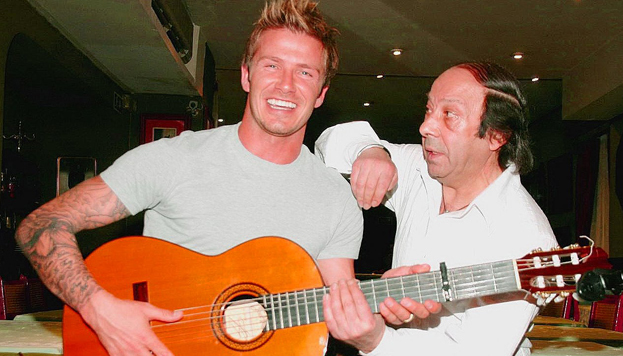 We’d close the doors and they’d stay on with the artists and they’d have a real flamenco bender! 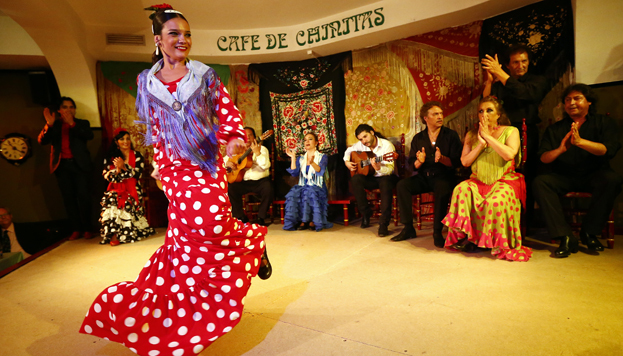 When the 80s came along, Madrid’s Movida movement put paid to this trend and although they didn’t fall into decline, the essence of the tablaos did become more streamlined – without abandoning their role as a showcase of the best flamenco and their connection with a foreign audience that visited Spain to enjoy genuine flamenco at its best. 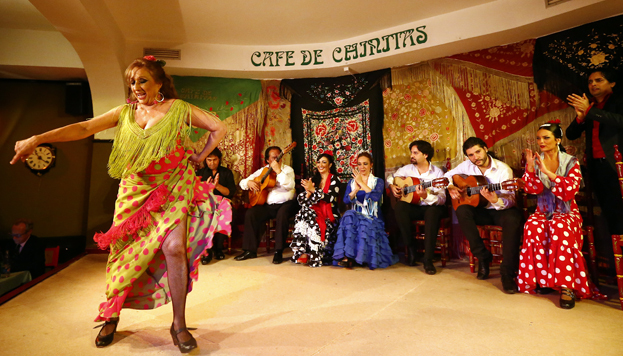 Mara can recite from memory the list of artists who have trodden the boards at Café de Chinitas: “As far as dancers are concerned, Tomás de Madrid, La Chunga, the legendary Rosario, María Albaicín, the great dancer and winner of the National Dance Award, Carmen Mora, Pastora Imperio…”. The list of singers is equally impressive: “María Vargas, Gabriel Moreno, the legendary Enrique Morente, El Lebrijano, José Mercé, who began his career here. And of all the guitarists, the one who stands out the most with all his magic was Víctor Monje Serranito”. The doors of the Café have been graced by bullfighters, footballers and all manner of athletes, intellectuals, members of the royalty and nobility and politicians of all hues; both Spanish and from overseas as is attested by the photographs that cover the walls of this venue that was designed by the great painter Manuel Mampaso, well-known decorator Pinto Coelho and architect Luis Caruncho. Its interior contains bronze and marble sculptures by Sanguino – who also sculpted the doors of the La Almudena Cathedral – not to mention an enormous selection of works by the painter Vicente Viudes. The result, as Mara explains, “highlights the eternal relationship between flamenco and bullfighting. Even now many “tonadilleras” (flamenco singers) still marry bullfighters.” 50 tables bedeck the Café’s 250 metres, each one covered by a beautiful Manila shawl and providing a perfect view of the stage which is located at the back of the room. 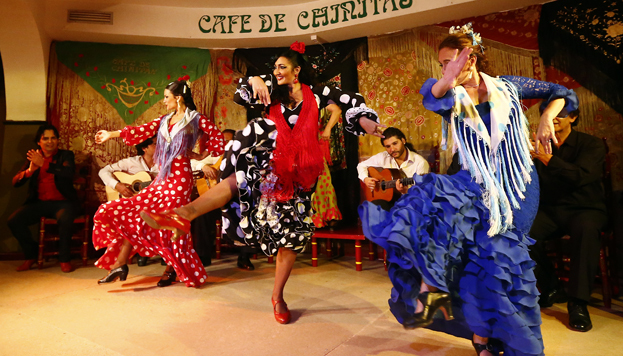 There are two amazing 90-minute flamenco shows each evening, both featuring a male dancer, five female dancers, three guitarists and three singers. “A genuine flamenco ensemble which leaves anyone witnessing the show feeling special, bewitched by the spell and the emotion of flamenco in all its intensity”. While they watch the show, the public enjoys exquisite dishes offering the best Mediterranean cuisine and featuring rice, ham, cheese…Once a year, the venue puts on a theatrical production of its own creation Remembering Lorca, which recounts aspects of the poet’s life and his poems. Although the tablaos began to enjoy a major tourist boom toward the end of the 80s, attracting tourists from all walks of life and of every nationality, this same boom put Spaniards off the tablaos. Mara explains that: “We have lost an entire generation of Spaniards who have never been to a tablao. Nowadays, the local audience is returning, but it’s no easy job reaching them. They tend to come with visiting foreigners who just happen to be in town. 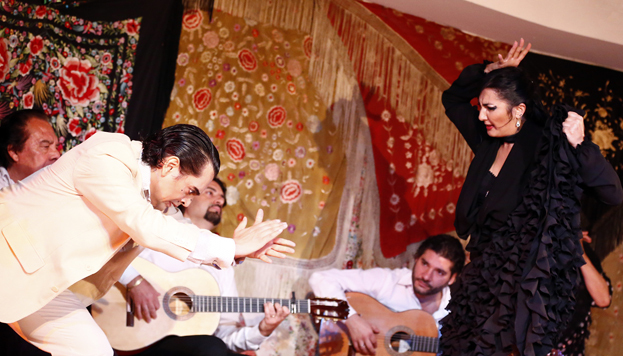 But once they do come, they’re hooked, because flamenco is very much a part of who we are”. Mara believes these cultural spaces that are so much part and parcel of Spain, ought to receive more support and attention: “They are becoming important again, but not as much as they ought to be. We still think that flamenco, our art and the work we do is more appreciated overseas than locally. That’s why we call for the support of the institutions so that flamenco can once again occupy the place it deserves in the cultural life of the city”.